A 62-year old male with no significant medical or family history presented to the clinic with persistent eosinophilia. 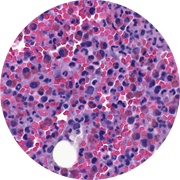 Bone marrow biopsy showed hypercellular marrow with markedly increased eosinophils and precursors. Fluorescence in situ hybridization (FISH) demonstrated a 4q12 deletion associated with the FIP1L1-PDGFRA fusion. FISH study showed no Philadelphia chromosome or BCR-ABL1 fusion gene. Reactive eosinophilia was excluded. The patient was diagnosed with myeloproliferative neoplasm with eosinophilia and abnormalities of PDFGRA (according to the 2008 World Health Organization's classification of tumors of hematopoietic and lymphoid tissue). The diagnosis is also called chronic eosinophilic leukemia associated with FIP1L1-PDGFRA. The patient responded to a tyrosine kinase inhibitor (Imatinib).